Tile floors can last a lifetime—if you take care of them properly. Luckily, compared to some other types of flooring, tile is fairly low-maintenance. All you need to keep the floor clean and shining is warm water, a bit of soap or cleaning product, and a chamois mop or rag. A tile floor should be "dry cleaned," or swept or vacuumed, at least twice a week to get rid of the gritty debris that can dull the finish of the tile floor. Wet clean, or mop, the tile floor in the kitchen every two weeks and in the bathroom once a week. Spot-clean the grout once every two to three months. The most common tile flooring, ceramic, and porcelain are a cinch to maintain, though it's often hard to see the buildup of grime under your feet. To clean ceramic or porcelain tiles, use nearly any type of cleaner, whether it's all-purpose, dish soap, or simple white vinegar—they don't scratch or lose their shine easily. Make sure you get into the corners, where dirt tends to pile up. A microfiber duster picks up dust and hair easily. Dip a rag or chamois mop—not a sponge mop—into the solution. Squeeze out the excess water, so it's damp and not soaking. Follow a pattern as you move through the room, so there's not an inch of the floor that gets missed. As you rinse out the mop or rag, the water will naturally get cloudier. Dump the dirty water and refill regularly to avoid leaving a hazy film of grime on the tile. If you finish up and notice that haze, create a mixture of white vinegar and hot water and run a damp rag over the film to get rid of it. Spray the grout with specific grout cleaner or mix up a bleach solution (using gloves, so you don't get bleach on your bare hands). Let it sit for a few minutes, and then rinse it off. If your tile is prone to forming water spots, dry it with a clean cloth immediately after mopping. Use a soft-bristled broom when sweeping natural stone tile floors, as they scratch much more easily than ceramic and porcelain. Make sure that you're using the right type of cleaner for the floor: Slate and marble tiles can't handle anything acidic, such as vinegar, while granite tile needs a pH-neutral mild detergent to avoid discoloration. Vinyl and linoleum floors are inexpensive alternatives to pricier stone or ceramic tiles, but the upkeep is just as important. Although a steam mop seems like an easy shortcut, vinyl and linoleum aren't made to withstand the extreme heat and moisture. Vinyl: After sweeping, mop with a manufacturer-recommended cleaning solution or a mixture of water and vinegar. Don't use abrasive cleaners, which can scratch the flooring. Linoleum: After sweeping, clean with a solution that's meant for linoleum flooring or a mixture of borax and water. Every three to six months, apply a coat of wax and buff to maintain the floor's shine. Use a rag or chamois mop instead of a sponge mop, which will simply push the dirt into the grout. Don't use vinegar or peroxide on the grout, as the acid will loosen it. Additionally, avoid any damaging acidic cleaners on the stone floor. Grout, especially if it's light in color, stains easily. If you can't get rid of the stain with regular cleaning, combine baking soda and water to make a paste. Apply it to the stain and let it sit for a few hours—or even overnight—and then scrub out the stain with a nylon brush (or, in a pinch, an unused toothbrush). 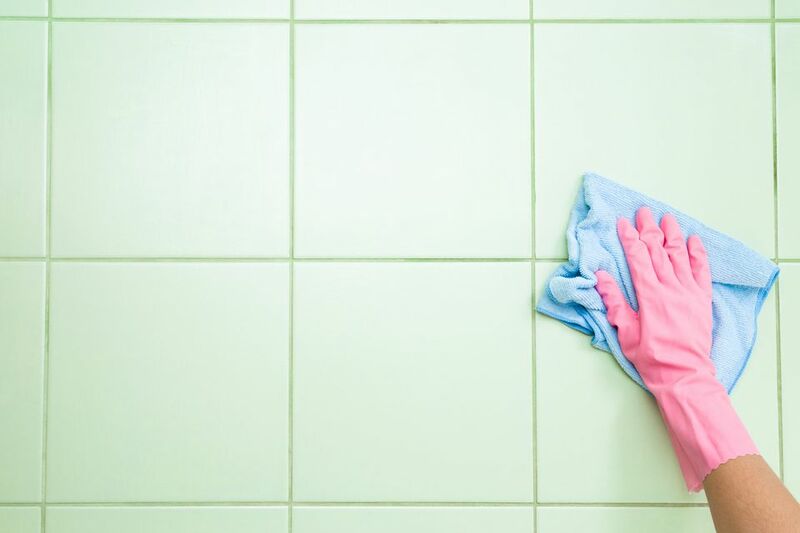 Some might recommend using a steam cleaner to get rid of grout stains; however, it could damage the grout if steamed regularly for the long-term. To avoid any risk, stick to a baking soda paste and, when clean, apply a silicone-based sealer to protect the grout. Do I Have to Mop Weekly?